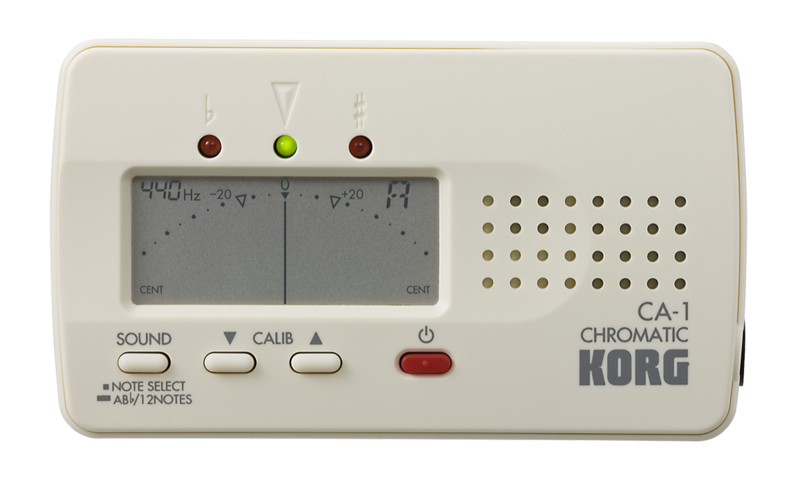 This compact chromatic tuner supports a broad range of C1 (32.70 Hz)-C8 (4186.01 Hz), allowing speedy and high-precision tuning of wind, string, keyboard, and other instruments. This orchestral tuner is ideal for tuning even low-register notes containing numerous overtones that are often difficult to tune. A high-sensitivity mic is built-in, allowing easy and accurate tuning of acoustic instruments such as ukuleles. A separately sold CM-200 contact mic can also be used to send the vibrations directly to the tuner for even more accurate tuning. 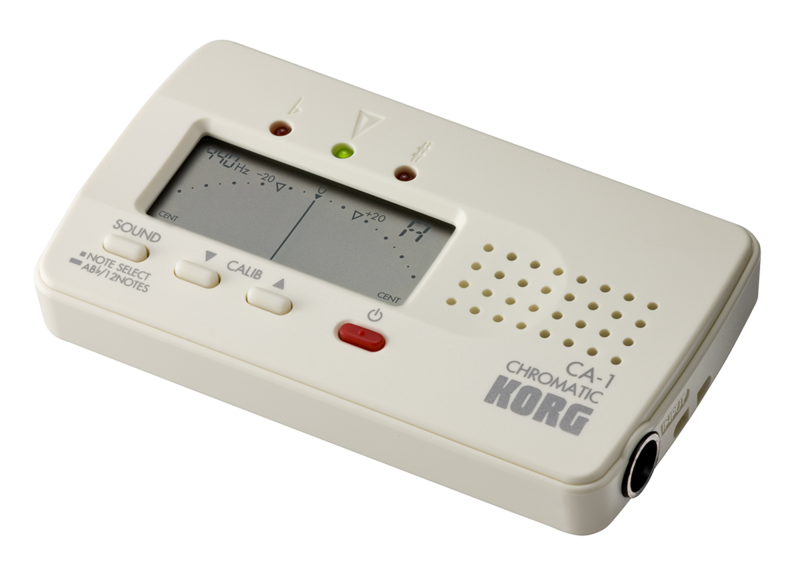 Although the CA-1 Chromatic Tuner is small, thin, and light, don’t let its pocket-sized body fool you. 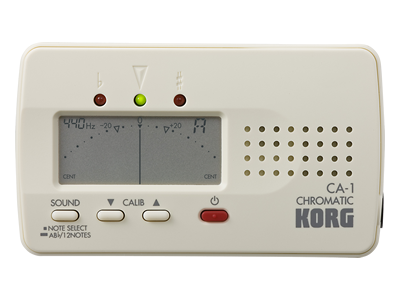 The CA-1 chromatic tuner packs the functionality needed for tuning a wide range of instruments. From studio to stage, tuning is easy and convenient. The back of the unit includes a unique arc-shaped "tilt slit" that lets you insert a plastic card for use as a handy stand. Inaccuracies of the harmonies in a triad are particularly easy to notice when played by an ensemble such as a brass band or orchestra. By slightly adjusting the pitch of a major or minor third relative to the equal-tempered interval, a beautiful-sounding pure third can be obtained. The meter scale of the CA-1ncludes markings to indicate pure major and minor thirds relative to a specified pitch. Simply by tuning your instrument to these markings, you can perform beautiful, pure harmonies when playing in an ensemble. * The choice of note to adjust when tuning to a pure major or minor third will depend on the music you&apos;re performing. In addition to visual tuning via meter, the CA-1 band and orchestra tuner can play reference pitches from its internal speaker (Sound Out) for tuning by ear. Each press of the Sound switch will cycle through the A4-Bb4 notes commonly used for tuning wind instruments. Or you can hold down the Sound switch to change the cycle to the semitone intervals from C4 through C5 (one octave), allowing reference pitches for any instrument to be sounded quickly. The Calibration function (410-480 Hz) supports a wide range of standard pitches, and can be adjusted in 1 Hz steps for accurate and flexible tuning to any song or key. Thanks to the Memory Backup function, the Calibration and reference pitch are remembered even when the power is turned off. The power will turn off automatically, if the unit is left powered-on for 20 minutes without performing any operation, avoiding unnecessary battery consumption.